If classics had no attraction, there would be no interest in old cars, old movies, antiques, or cowboys. But luckily we have a romantic bond with the past which has shaped what we wanted to be when (or if) we ever grew up. I am sure almost every kid, more specifically boys, wanted to be a cowboy at one point or another. 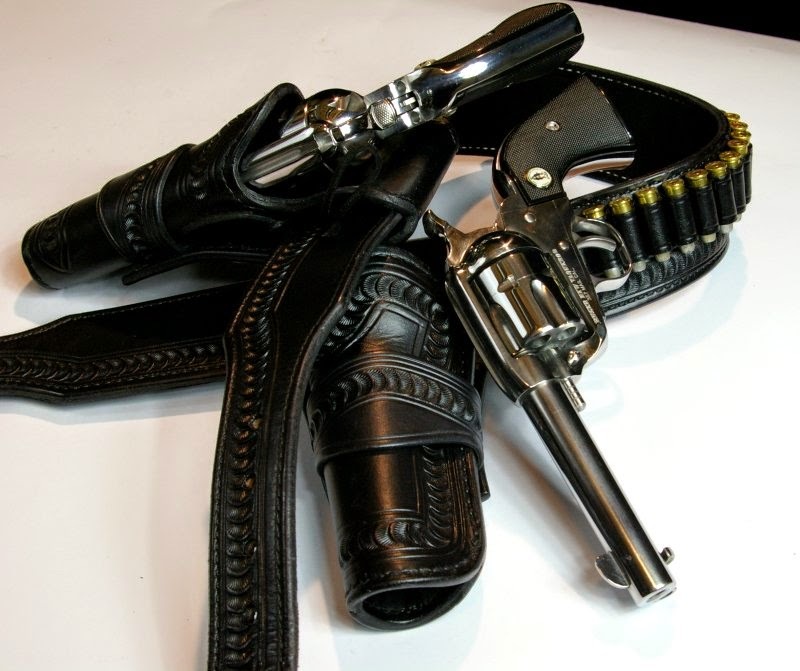 For me I seemed to alternate between pretending to be both the good guy and the bad, however I always had my dual cap guns strapped to my waist scaring the crap out of one or another stray cat on the property. I would sneak up on them and "Pow Pow", then giggle like made. Never have liked cats, and still don't. Mom and dad definitely got mileage from that cowboy outfit and accompanying cap guns. After Mrs. Pandemic an my visit to Oklahoma City and the National Cowboy Museum, I felt all those emotions rushing back again. Thousands of strands of barbed wire, stunning custom presentation firearms, and a whole lot of movie and real life history. If you have not been to the museum, it will be one of the most fun experiences which will drive you to a giddy kid laugh. 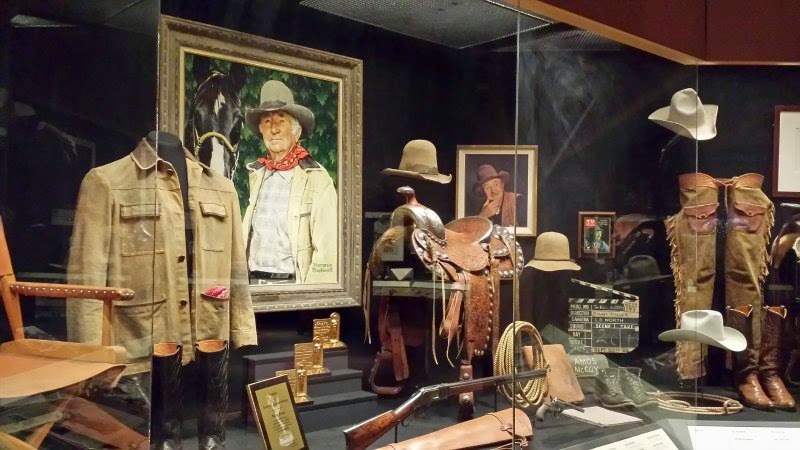 All the cool stuff you saw in the movies is there from Roy Rogers, to Wild Bill's cowboy western show to, the Three Amigos, to everything from Clint Eastwood. 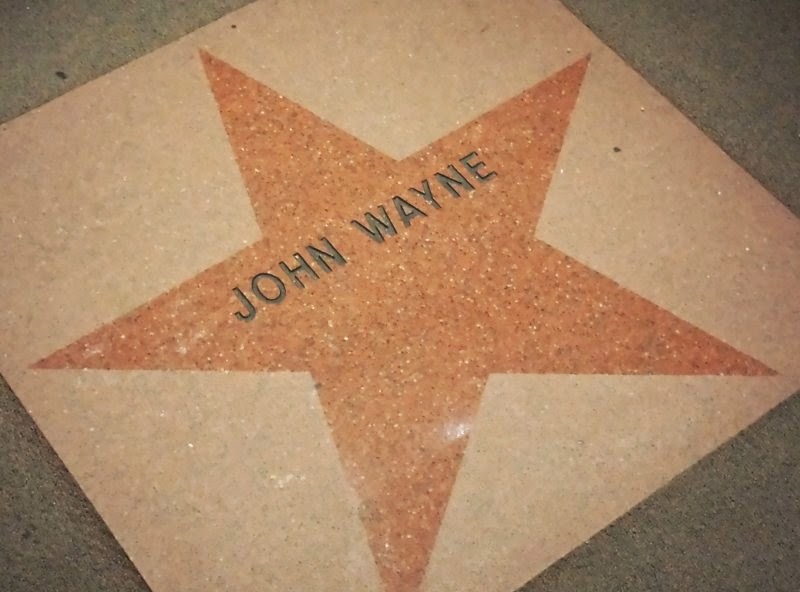 The movie history was a small percentage of the museum and was interesting, however it was the real life history of the West which was interesting and emotionally powerful. One day was not enough. 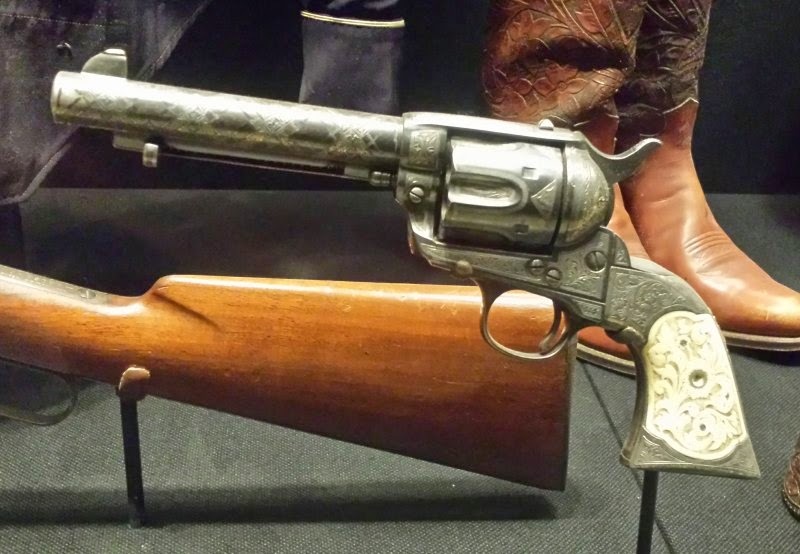 What made the visit even more fun was that I had just invested in and started shooting a gorgeous matched set of polished stainless steel Ruger SASS (Single Action Shooting Society) Vaqueros single action revolvers and an equally stunning El Paso Saddlery Leather Speed Rig for the revolvers. Yes, I am a big kid and I will tell you that have not had more fun on the range than I do with this setup. With practice, I hope to participate in at least a couple SASS competition. 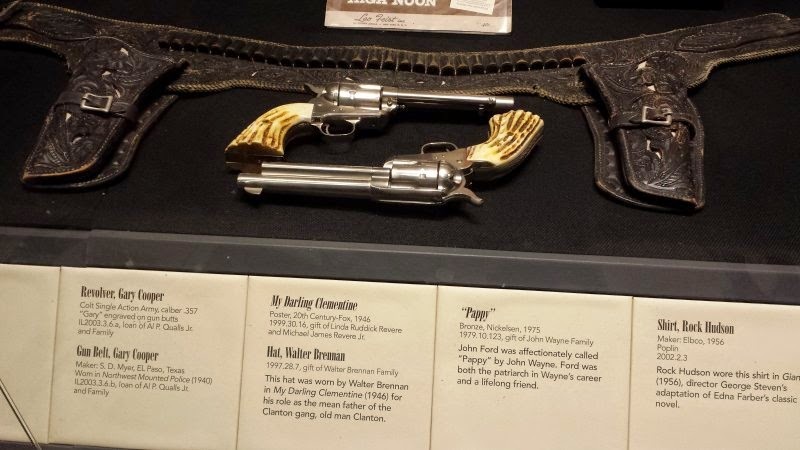 Visiting the museum just reinforced my "investment" and deepened my appreciation for the history of the Ruger revolver set and El Paso Saddlery rig. 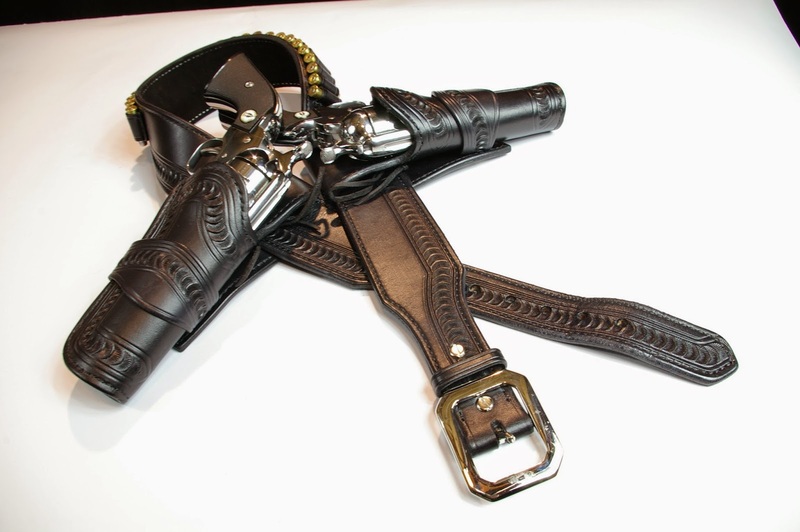 If you have a stunning set of revolvers, it only makes sense that you need a stunning belt and holster rig such as this gorgeous El Paso Saddlery Speed Rig. Fit and finish are perfect on the El Paso Saddlery rig with not a stray stitch or imperfect cut anywhere. Based on my research, El Paso Saddlery leather is the premium leather crafter for SASS. 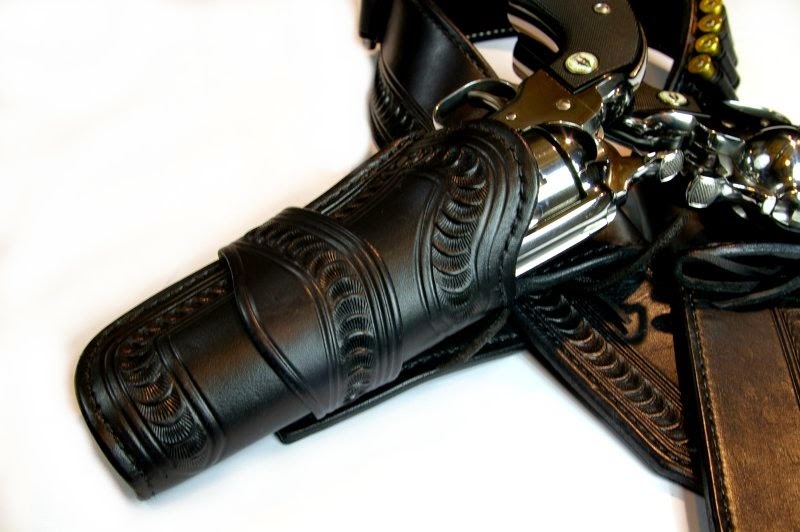 It makes sense considering each and every holster and belt is made to order. 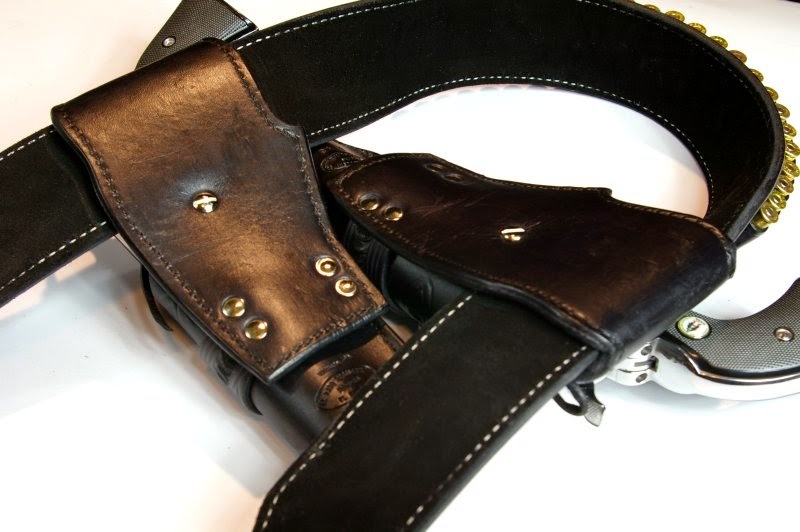 The wait is around two months and the cost is just under $500 however both the cost and wait is worth it to have a custom made holster and belt rig to your specs. 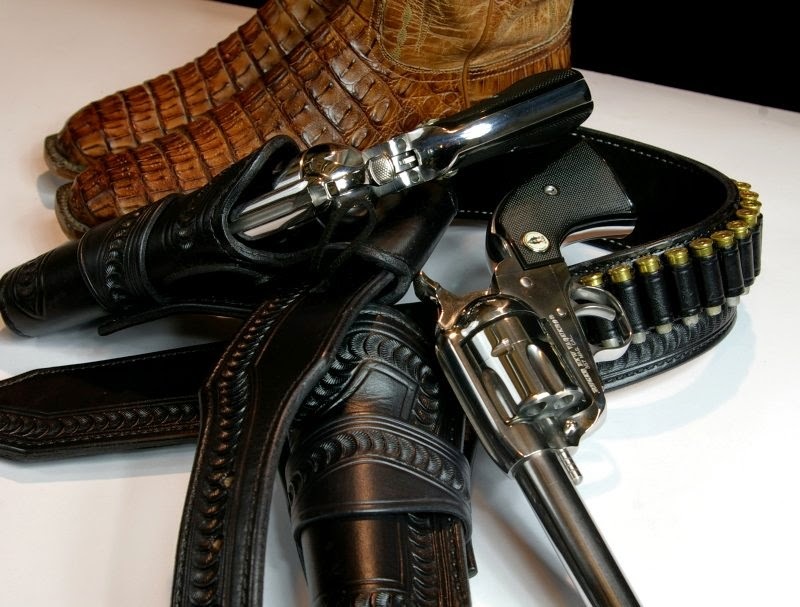 Options include leather (including exotics), leather color, ammo loops on the belt, tooling/decoration, revolver make and model, a second weakside holster, barrel length, and straight or cross draw holster types. 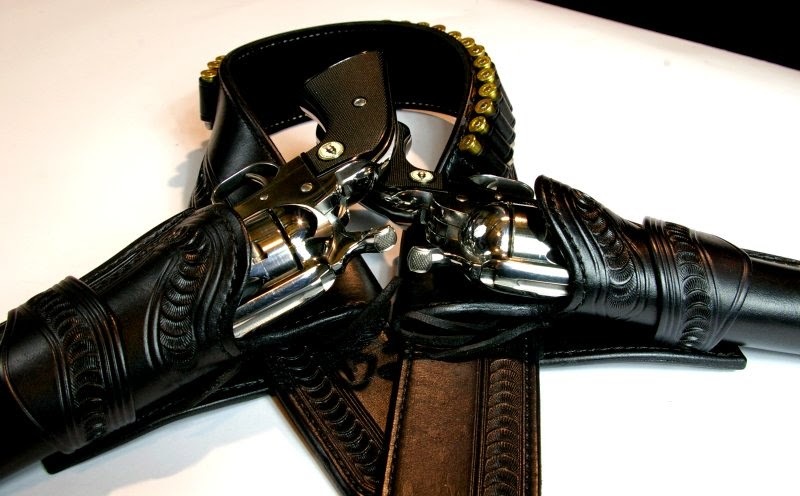 I choose black cowhide with tooling, for my Ruger Vaquero revolver set with left and right side holsters. 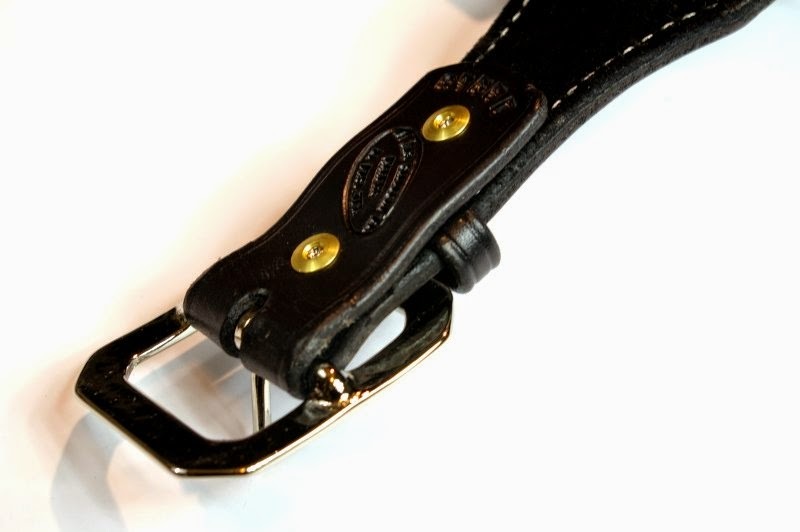 El Paso Saddlery leather suggests adding 2" to your belt size, however be aware that measurement is two inches larger than a belt size would be over your clothes and not the belt you use to hold up your pants. 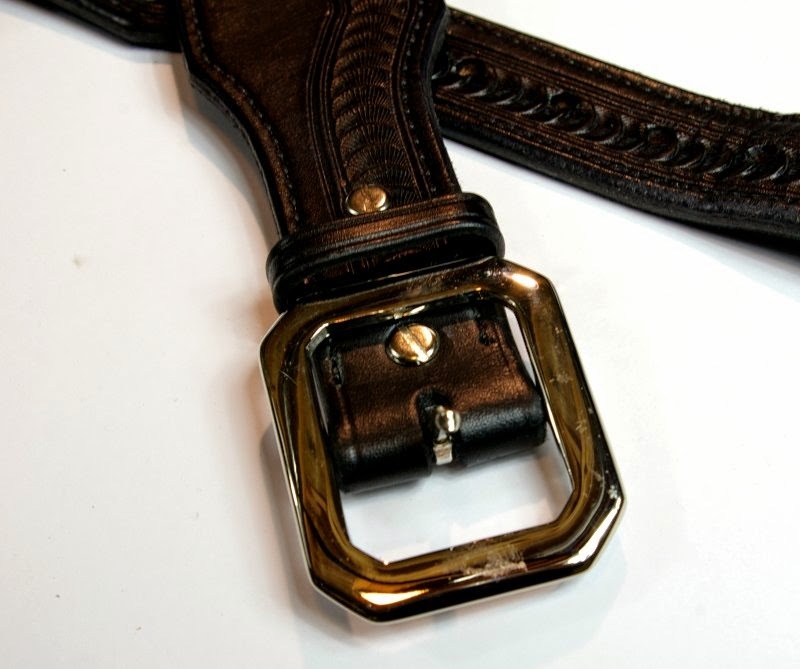 Put on a typical outfit and measure your belt size over everything you have on. I miscalculated and only have one extra hole left for food consumption based expansion, so I suppose this is an incentive to assure I don't gain any weight and keep myself in decent shape. 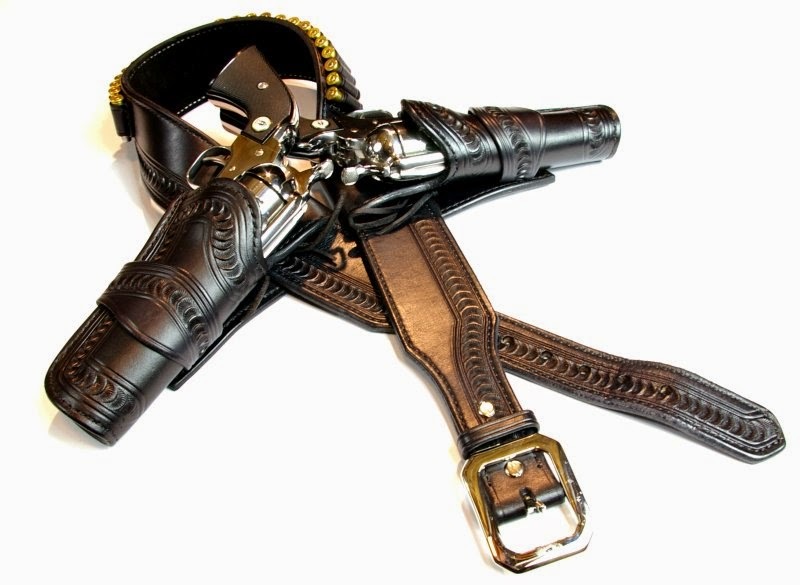 The Speed Rig belt and holster setup is a El Paso Saddlery tuned design which is a good all around hoster design and is not steel lined but is extremely rigid. 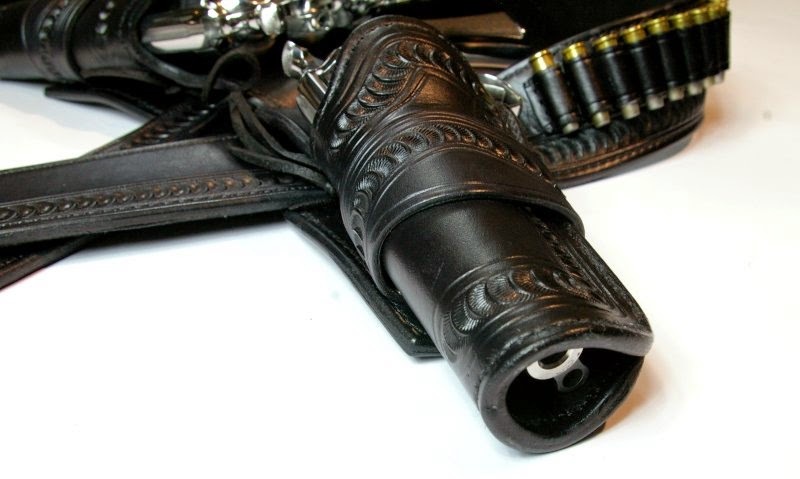 Addition safety features are hammer loops on the holsters which essentially lock the hammer down and prevents the pistol from being cocked in the holster or falling out. 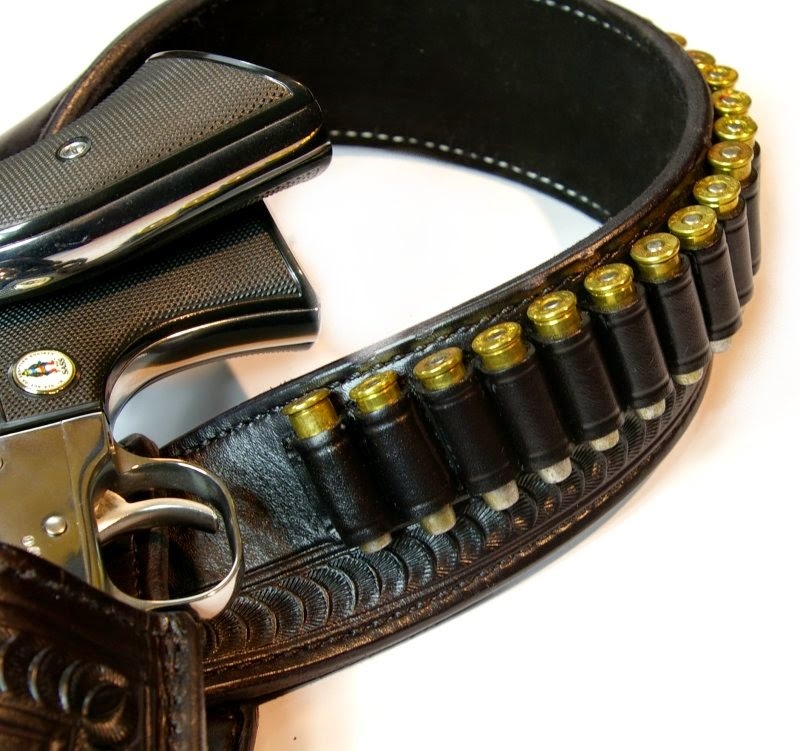 My belt has ammo loops which competitors usually fill with empty dummy rounds for safety, which is what I did. 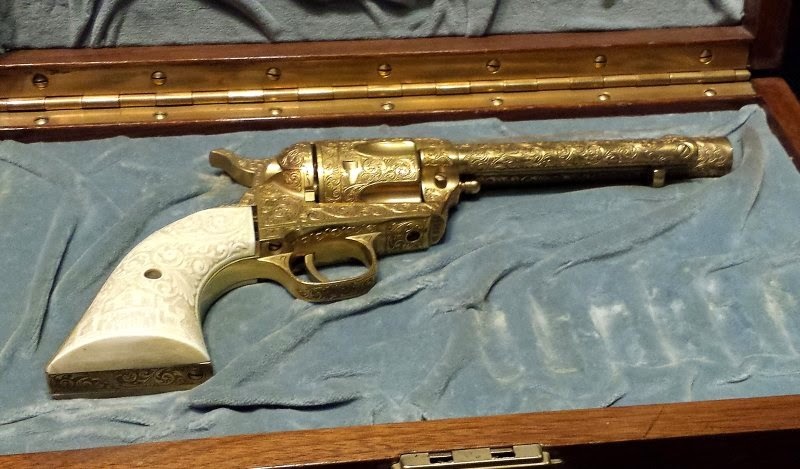 I simply took fired brass and pressed a bullet in place without replacing the primer and no powder. It completes the look. 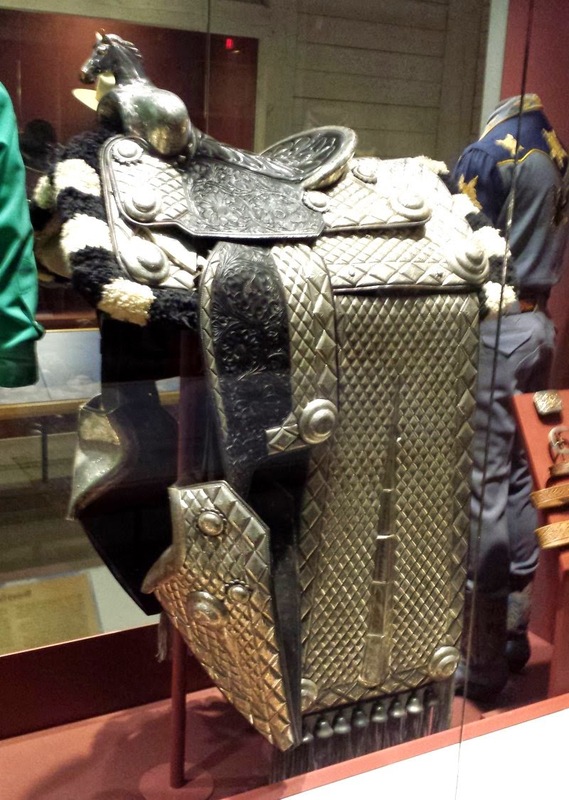 The belt does require break in; a lot of break in. 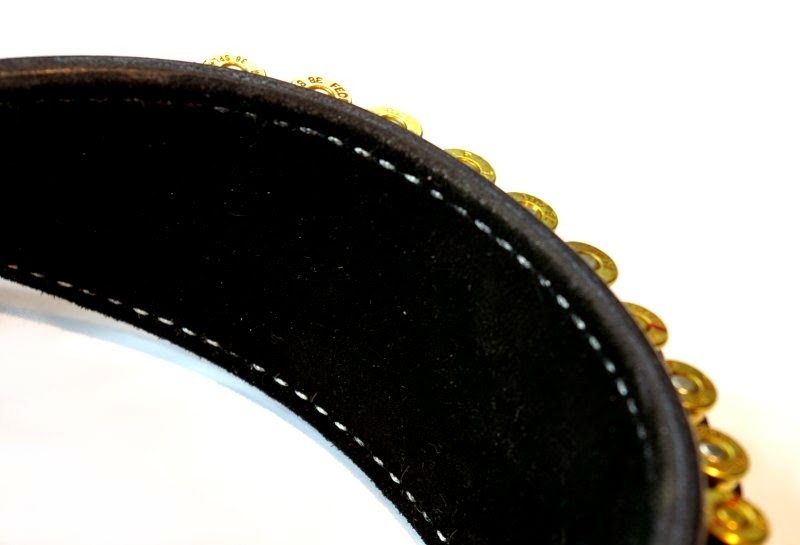 The leather is full thickness premium leather and has taken me months of wear to get it really settled in and comfortable and still has a way to go. I work out of my home office. 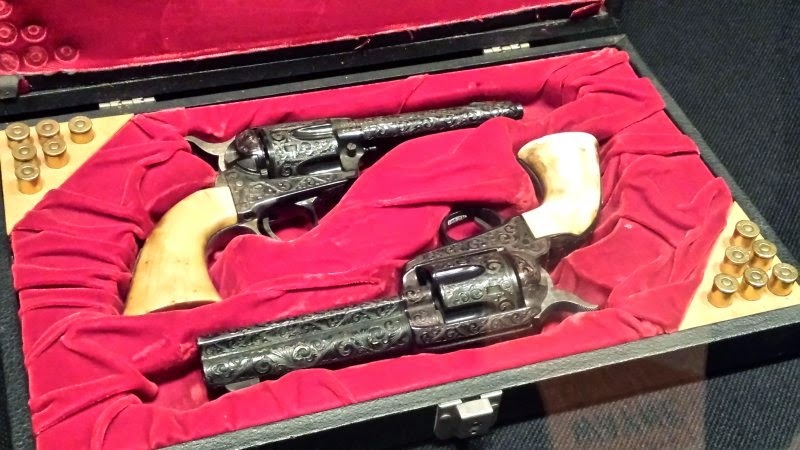 The other day, my wife came downstairs to my office/lair/corral to find me in flip flops, a Barnes Precision t-shirt, camo cargo shorts, with my El Paso Saddlery rig on with pistols in place, and my Bond Arms derringer added to the belt... It was quite a look. It took her a little by surprise, however it's her own fault. If I would have known she was coming down, I would have slipped on my Lucchese boots and cowboy hat also. Yep, I am a big kid. I have long days of being on conference calls and I find this a great opportunity to break in the belt and practice dry firing. My UPs driver stopped being surprised by me wearing the rig to answer the door And now only asks if the leather is broken in yet. Jumping into this top tier SASS dual pistol, belt and holster was without question an "investment" of which i am still learning more and more about its use each day ... on conference calls and at the range. This is very much a case of buying a formula one race car an then learning how to drive it, but the challenge has been a blast. As I watch YouTube videos of the pro SASS shooters, you start to realize how freaking crazy awesome these folks are. My first time out at the range I took it safe and slow, however even at that speed, hitting my steel Action Target with a slow calculated shot from the hip is way harder than it looks, but you are hooked instantly. 400-rounds and hours later, I was hitting the target with decent regularity from the hip. Fast forwarding a few months and I am able to draw and fire from both holsters quickly and hit the targets reliably, however I still have some work to do especially when shooting Gunfighter Style with both guns alternatively firing. 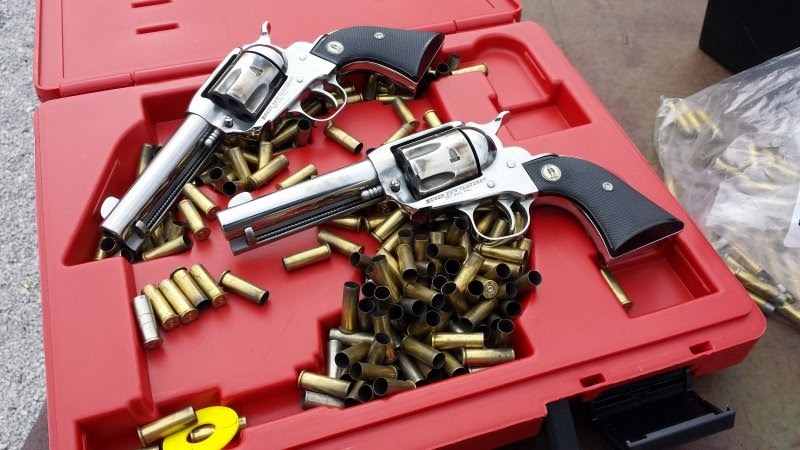 The more you shoot these single action guns, the more you are hooked. At a time where we are Tactical Everything, it has been refreshing to slow down a bit with this set of single action Ruger Vaqueros mounted up in this stunning leatherwork masterpiece that is my El Paso Saddlery leather rig. Most importantly, I feel like a kid again, get plenty of enjoyment out of it both on and off the range. Every quick shooting advantage has been included in this top of the line rig. The smooth design and attention to detail give the Speed Rig not only a great look, but a quickness that makes it a winner. Holsters are blocked with specially designed pistols that angle the top line of the holster, making reholstering the easiest it's ever been.